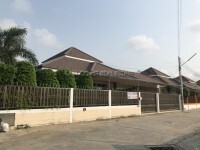 Bang Saray villa. This beautiful stand alone villa really is as tropical and picturesque as it shows from the photos, perhaps even better in real life. Secluded behind 2 metre perimeter walls, you are first greeted by a large garden and private swimming pool. All around the house the is plenty of shade due to the extended roof line, plus it does have a shaded poolside patio. Inside, and the feeling of quality is obvious. The whole external of the home is insulated double brick cavity walls to keep the heat out, and the coolness locked inside. There is a large open plan living room, and kitchen diner, plus 3 full en-suite bedrooms. Behind the carport on the other side of the garden is a self contained en-suite guest house. The property is partially furnished, however there is a full European kitchen, and dining table and chairs, built in wardrobes in every bedroom, 2 LCD TV\'s with surround sound systems, 3 air conditioners, outside kitchen and BBQ, laundry room and store, and the guest house is fully furnished. Other practical items are 3,000 litre underground water tank, plus the house has WiFi internet and telephone. Living area : 230 sqm.